Medics work to save the life of a wounded soldier. BAGHDAD, Iraq (CNN) -- "Don't let me die! 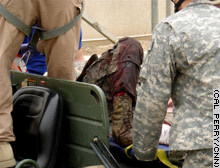 Please, don't let me die," the U.S. soldier said repeatedly as medics carried him to the trauma room. "Hell, yes, you are," replied Capt. David Steinbruner, one of the doctors. CNN has withheld the names of the wounded soldiers for privacy concerns. In Iraq, roughly 17,500 U.S. troops have been wounded, and nearly 2,500 have been killed. The survival rate is significantly higher than in previous wars, and much credit goes to those working to save lives in places such as the 10th Combat Support Hospital. "If you look at the overall death rate ... the case fatality rate is cut in half from Vietnam to now. And again I think that's due to better training, tactical combat casualty training," said Col. John Holcomb, the senior surgeon at the hospital. At least eight doctors and nurses worked on the soldier with the shredded leg -- their arms and clothes drenched in his blood. His femur protruded from his upper thigh. A nurse clutched one of his hands. Outside in the hall sat the clothes of these wounded men -- or their "battle rattle," as it's called. Flak jackets lay blown in half, boots drenched in blood. Down the hall, a private first class who was driving the vehicle was put gingerly on a bed. He was in better shape than his comrades despite bad burns on his hands and metal in his neck. Still filled with adrenaline, he breathlessly relived the attack for the nurse. "It just exploded. On the left side or under the vehicle -- I'm not sure. Everything was on fire," he said. "I got out through the gunner's position and got one more out." As the doctors and nurses work, the captain of the wounded soldiers' unit sat, head in hands, torn up. At times, he spoke to his commanding officer, a major, in an inaudible tone. Single tears ran down his cheeks. The private called his wife and explained what happened, followed by a short smile. "I'm fine, I'm going to be OK. That's fine, fine; you just go ahead and pray. Pray." Steinbruner took the phone and spoke soothingly: "He's going to be fine -- you hang in there now." He turned, shaking his head: "She's totally in shock." Back in the main trauma room, the soldier with the torn leg hung on, fighting with every breath. He remained conscious. Steinbruner suggested putting him under anesthesia completely. "He's a sick boy. We need to put him down. He's totally with it. He said, 'Please, don't let me die.'" "Just breathe deep -- there we go, nice and deep. ... You're a healthy guy," Steinbruner told the soldier. "I'm not going to die -- am I?" "Look, I promise -- I wouldn't lie to you," Steinbruner said. Serving as both doctor and impromptu commanding officer, Steinbruner added, "Don't you dare try to die on me. I didn't give you permission." Through a condensed face mask, the soldier wheezed and coughed, "Am I gonna lose the f------ leg?" "I don't know," Steinbruner replied. "We'll try to save it if we can, OK? I just don't know. I can't give you an answer on that." The near dozen doctors, medics and nurses stopped the blood from pouring out of him and prepared to send him to surgery in an attempt to save his leg and hand. "Thank you, sir," Steinbruner said to the senior surgeon, Holcomb, while taking off his blood-drenched gloves and tossing them in the trash. The surgery was a success. The soldier survived and kept his leg for the time being. Once close to death, he is now being treated at a U.S. military facility in Germany. "He asked me if he's going to lose his leg, and I said, 'I don't know,' " Steinbruner said minutes after working to save the soldier's life. "I never lie to them. I'll say to them, 'I just don't know.' It was tough. It's tough." He paused in thought. "That's the kind of thing we face out there. ... I mean ... I think there were several killed out there as well." He paused again and said, "I'm now going to go take care of his buddy." And then he walked away and went back to work.